Gin is suddenly hot again. I didn't forget Bourbon, nor have I forgotten Vodka. I still take a sip of Absinthe now and again. But for a slurp of flavor, packed with botanicals and dare I say juniper, nothing comes close to Gin for sensual aromatics and freshly cut herbal flavors. 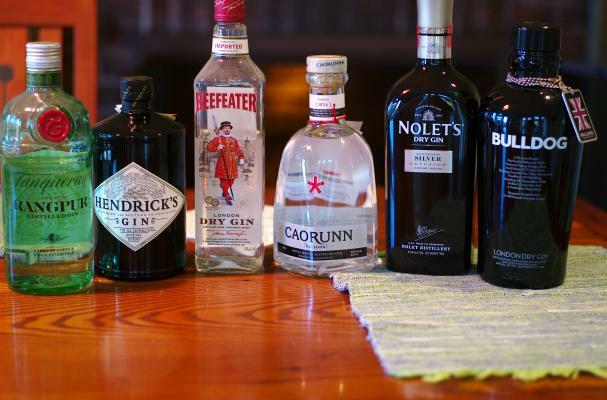 Gin also is a powerful beverage-countries have made Gin their national drink- 80 proof and above are the normal dosage of palate warming alcohol. Sure Rum is my usual go/to in a snifter. But recently I've found that Gin has certain magical qualities on the rocks or straight from your freezer to your tongue. Sure, you may want to pour some into a glass first, your lips will stick to the glass bottle! No matter how attractive the packaging, pour some Gin into your glass first to fully appreciate the flavor packed into every glistening sip. Crisp and lively in a snifter- I'm charmed by the Celtic Botanicals and slightly salty nose. Try a couple slices of Granny Smith apple in your glass along with a cube or two of distilled water ice. This is very sophisticated Gin, meant for sipping. The apple is not just there for color- it's there for flavor! The first tastes I get are from lavender, citrus oils and juniper berries. This Gin will surprise your sense of flavor with an 80 proof alcohol level that tastes like some of the more powerful offerings. I love this gin with a chunk of freshly squeezed grapefruit juice infused ice. Nothing more is necessary! It's a bold Gin and you'll know it immediately. My first impression of Hendrick's drives the complex flavors of cucumber and Turkish Rose oil wrapping around and coating my tongue. I've taken chunks of a peeled, European cucumber, muddled it with freshly squeezed lime juice, Royal Rose (Rose) Simple Syrup and a couple cubes of Rosewater infused ice cubes. Then add a three shots of 90 proof Hendrick's Gin to your glass. Finish with Q-Tonic Water to taste. That's it! The lime is already in the bottle with the Tanqueray Rangpur Gin. My favorite way of enjoying this highly aromatic Gin is with a slice or two of cucumber and freshly drawn seltzer water. The citrus elements are quite pronounced so the addition of extra citrus is just not necessary. Sure you can mix this Gin with simple syrup, some Bitter End Thai Bitters and tonic water- it makes a finely twisted cocktail. Less is more with Rangpur! Roses, freshly cut in the garden is the initial flavor of Nolet's Dry Gin. It's almost fruity in nature- with the heady aromatics of sweet cream and Asian spices. I don't recommend mixing this Gin, there is so much going on in there- cutting it with a bit of well water may be all that is necessary. I fully believe that even a drop of Vermouth would be overpowering. This Gin rolls in at a hefty 95.2 proof, but it doesn't taste hot in the glass. Quite the opposite in fact. It's quite remarkable stuff! Take a snifter, add one cube of ice. Add a couple shots of Nolet's and read a good book. Suddenly Beefeater is exciting again. This staple of the cocktail lounge is making a comeback in creative cocktails the world over. I've tasted it in a Martini and straight (without vermouth) but with the addition of a lemon zest. My preference is the latter. Beefeater Gin is dry, crisp - not like the Nolet's or the Caorunn- certainly not as aromatic as the Bulldog, nor the Rangpur- but for the drinker who seeks something a bit more Vodka-like and merely scented, may I recommend Beefeater. A drink that says- I'm cool... Here's one for you- this should be called a Lemon Peel Cocktail. Zest a Myer Lemon into a long thin strip. Chill down a couple of shots of Beefeater Gin. Pour into a pre-chilled Martini glass. Garnish with the lemon zest and sip your way to England. Elegant in a mixed drink and it should be at just under 100 proof.